When my boyfriend and I went to this tiny, hole-in-the-wall pizza place that has the best garlic cheesy bread ever, no joke, and after eating a plate full, we contemplated ordering another before we started on our pizza. 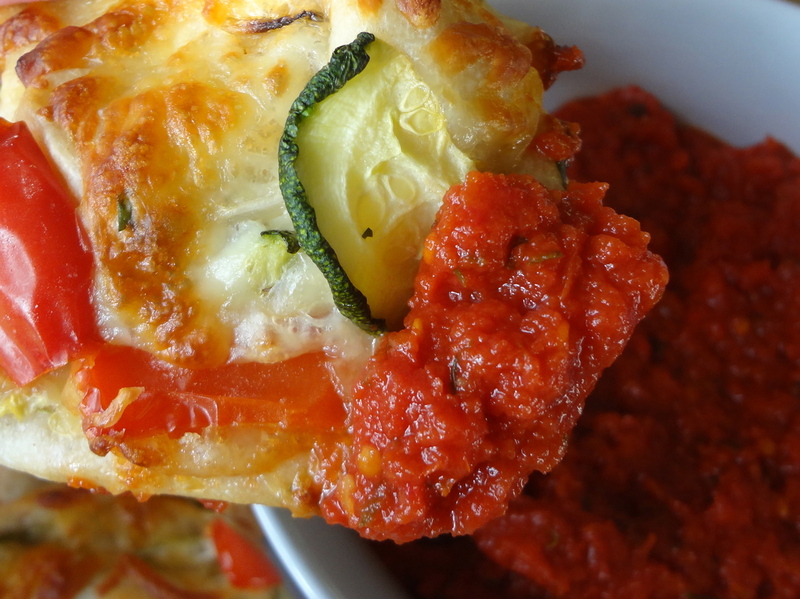 These roasted veggie pizza rolls, however, are a fantastic way to get the taste and feel of pizza without overdoing it. Or really committing to a whole slice. Perfect for those moments at parties where you’re thinking, I really want another piece of pizza, but can I eat that whole thing? Problem solved. Make it smaller, make it cute, and you can eat twice as much while telling yourself that it doesn’t even really count because it’s practically bite-sized. See? I got your back. 1. Place the red pepper halves on a baking sheet lined with aluminium foil. Heat your oven to 450 degrees and roast the peppers until their skins are black, bubbly, and charred – about 15 minutes. 2. Carefully pull the peppers from the tray, toss them in a dish, cover the dish with plastic wrap and let them sit for about 5 minutes. This makes the skins much easier to remove. 3. While you wait, toss the zucchini on the cookie sheet, this time line it with parchment paper, and drizzle with a teaspoon of olive oil. Mix them around to evenly coat the slices, then pop them in the oven until they are tender – about 5 minutes, depending on the thickness of the slices. 4. Peel the skins off the red peppers, and cut them into large chunks. Add the zucchini to the peppers and set aside. 5. Roll out your pizza dough into a rectangle, and sprinkle half of the mozzarella over it. 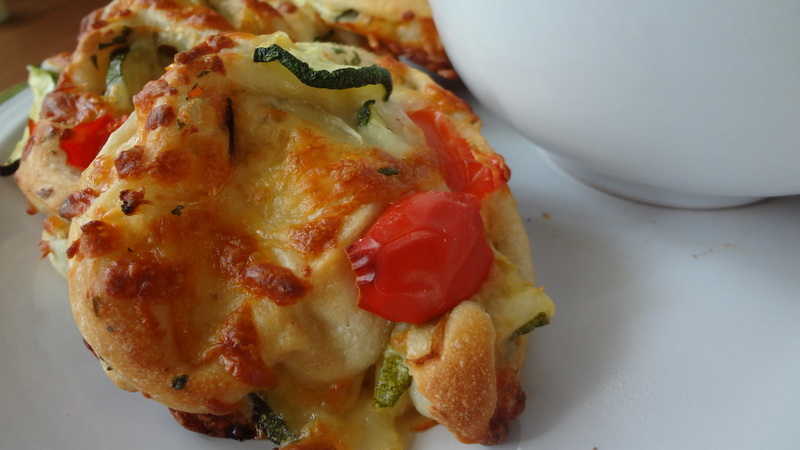 Top with the zucchini slices and chopped peppers, then top that with the rest of the cheese. 6. Very carefully roll up the pizza dough from the long side, and press the seam together when it’s completely rolled up. 7. Using a serrated knife (only use a serrated knife, it makes it SO much easier) cut your pizza log into 1-inch thick pizza rolls. 8. Place your pizza rolls on a baking sheet lined with parchment paper and bake at 350 for about 15-20 minutes, or until the dough is golden brown and the cheese is just turning golden and bubbling. Serve with your favorite pasta sauce. This method could be used with any combination of toppings to recreate your favorite type of pizza! 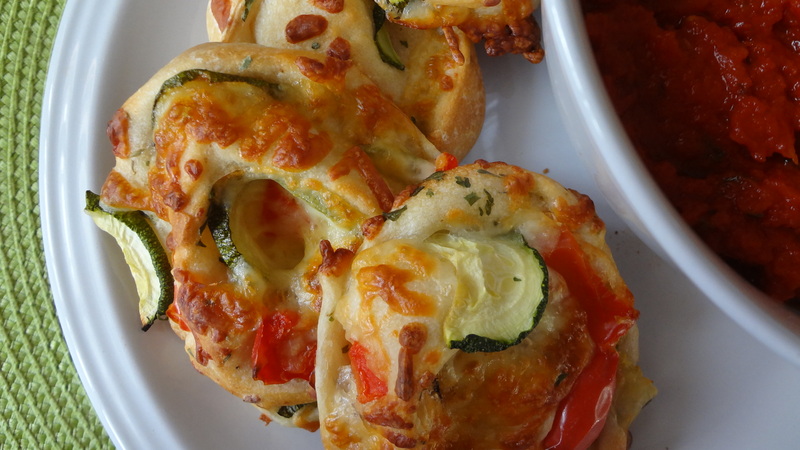 This entry was posted in Uncategorized and tagged Appetizer, cheese, homemade pizza rolls, Mozzarella, Party Food, pasta sauce, Pizza, pizza rolls, roasted red peppers, Tomato sauce, Vegetarian, Zucchini by theculinarycapers. Bookmark the permalink.